All of Brighton Grammar School’s policies are intended to be up to date and be consistent with all relevant laws. Employees are expected to comply with all applicable policies. Various parts of the policies require managers and staff to exercise discretion and the policies are not intended to be applied in a legalistic or prescriptive manner. These policies may be varied by Brighton Grammar School from time to time, in its absolute discretion. The policies do not form part of an employee’s contract of employment. The purpose of this Policy is to provide clear guidelines to employees, contractors and other volunteers/visitors (‘individuals’) to the School regarding expectations when interacting with students and other children. Brighton Grammar School is committed to fulfilling its duty of care to all students and specifically students under the age of 16 in relation to the Crimes Act 1958 (Vic), which was amended in 2014 to include offences of: (i) failing to disclose a sexual offence; (ii) grooming for sexual conduct; and (iii) failing to protect a child from sexual offence. This policy is underpinned by the Crimes Act 1958 (Vic). Ministerial Order 870: Child Safe Standards – Managing the Risk of Child Abuse in Schools. This Policy applies to employees, contractors and other visitors (‘individuals’) to the School. Note: any reference to legislation in this policy includes a reference to the legislation as amended from time to time. Ensure all reasonable steps are taken so that all students of the School are safe from abuse, including sexual abuse, and they feel safe at all times. Children with a disability or special needs. Enable School Council members, all persons in positions of authority, care or supervision, all employees of the School and where applicable, students of 18 years or over to understand their role and responsibility in protecting the safety and wellbeing of children and young people, particularly those under the age of 16, in accordance with the Crimes Act 1958 (Vic). Ensure all members of the School community aged 18 and over understand their reporting obligations in accordance with the Crimes Amendment (Protection of Children) Act 2014 (Vic). Ensure that all individuals at the School or working with students are aware of, understand and comply with the principals of the Child Safe Standards (http://www.dhs.vic.gov.au/about-the-department/documents-and-resources/policies,-guidelines-and-legislation/child-safe-standards). This Policy requires individuals to be familiar with the requirements of State and Federal Legislation regarding the Protection of Children against all forms of abuse. It also requires individuals to demonstrate a duty of care to take all reasonable steps to prevent incidents which may expose a student or another child to harm (in accordance with Mandatory Reporting Policy). The School recognises that children and students have a right to be treated with dignity and respect, free from emotional and physical danger, abuse (including sexual abuse) and neglect. In addition, the Policy is intended to protect the reputation and wellbeing of supervising adults from allegations or misunderstandings. It applies to both appropriate workplace behaviour and behaviour expected when outside the workplace while in the employment of the School. If further explanation of any of the instructions provided here is required, it should be sought from a Head of School, the Director of Human Resources or the Headmaster. As an overarching principle, the Headmaster must be kept informed of any issue relating to potential or actual risk to the protection of students and children (in circumstances where it impacts upon the School) and / or reputational risk to supervising adults or the School. Through cultural awareness programs for students at all levels, the School will promote and protect the cultural safety of its students in a sensitive and caring manner. A register of cultural awareness programs (including disability awareness) will be monitored and reviewed annually to evaluate its effectiveness and appropriateness. Provide support for staff in undertaking their responsibility in this area. Ensure that Child Protection Education & Programs are accessible and understood by students of all ages, cultural background and abilities. Understand their obligations to report reasonable belief of child sexual abuse to the police. Reporting child sexual abuse is a community-wide responsibility. The Failure to Disclose offence imposes a clear legal duty upon all adults aged 18 and over to report information about child sexual abuse to police. 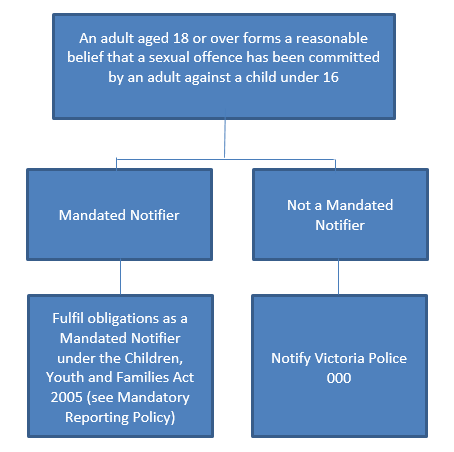 Under section 327 of the Crimes Act, any person (including any staff member) of or over the age of 18 years who forms a reasonable belief that a sexual offence has been committed in Victoria by an adult against a child under 16 years of age must disclose that information to police, as soon as it is practicable to do so. Failure to disclose the information to police is a criminal offence, except in limited circumstances such as where the information has already been reported to DHHS Child Protection. The offence applies to all adults in Victoria, not just professionals who work with children. signs of abuse lead to a belief that the child has been sexually abused. Any adult aged 18 or over who forms a reasonable belief that a sexual offence has been committed in Victoria by an adult against a child under 16 must report that information to Victoria Police by dialling 000 (or otherwise to a Member of the police force of Victoria). The victim is 16 years of age or older and does not have an intellectual disability that limits his/her capacity to make an informed decision; and he/she does not want the information reported to the police. The victim has disclosed the information in confidence in the course of a therapeutic relationship with you as a registered medical practitioner or counsellor. The victim turned 16 years of age before 27 October 2014.
a reasonable belief that the information has already been reported to police or Department of Health and Human Services (DHHS) Child Protection disclosing all of the information. a reasonable fear that the disclosure will place someone (other than the alleged perpetrator) at risk of harm. Mandatory reporting involves informing the Department of Health and Human Services of conduct involving a child 17 years and under that would constitute abuse (physical, emotional or sexual), neglect or exploitation. In the case of students who are over the age of 18, the required contact point will be Police. The protection of children is regulated by the Children, Youth and Families Act 2005. Section 182 specifies that a person registered under the Education Training and Reform Act 2006 or who has been granted permission to teach under that act is designated as a mandatory reporter. A child has suffered, or is likely to suffer, significant hardship as a result of sexual abuse and the child’s parents have not protected, or are unlikely to protect the child from harm of that type. If the individual teacher or the School notifies DHHS in good faith, based on having reasonable grounds for forming the view that the child is at risk, it will not be considered unprofessional conduct by the teacher or the School. In every case, where it may be necessary to report a matter to DHHS or the Police, the Headmaster must also be notified as a matter of urgency; he will assist the teacher or other employee in making the report and ensure that they are provided with support. Section 49B of the Crimes Act relates to the offence of “Grooming for sexual conduct with a child under the age of 16 years.” The offence targets predatory conduct designed to facilitate later sexual activity. The offence can be committed by any person aged 18 years or over. The offence of grooming concerns predatory conduct undertaken to prepare a child for sexual activity at a later time. The offence applies where an adult communicates, by words or conduct, with a child under the age of 16 years or with a person who has care, supervision or authority for the child with the intention of facilitating the child’s engagement in or involvement in sexual conduct, whether with the groomer or another adult. Grooming does not necessarily involve any sexual activity or even discussion of sexual activity – for example, it may only involve establishing a relationship with the child, parent or carer for the purpose of facilitating sexual activity at a later time. The sexual conduct must constitute an indictable sexual offence. This includes offences such as sexual penetration of a child, indecent assault and indecent act in the presence of a child. It does not include summary offences, such as indecent behaviour in public. Should any member of the School community aged 18 and over become aware of grooming behaviour by a person aged 18 years or over, they should notify the police and/or the Headmaster immediately. 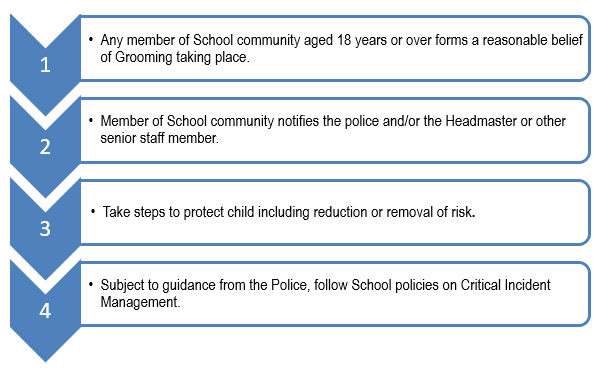 It is the responsibility of the Headmaster and/or others associated with the School with authority or responsibility, to take action upon becoming aware of grooming behaviour to protect (so as to reduce or remove a substantial risk) in accordance with the ‘failure to protect’ offence (see below). Section 49C of the Crimes Act states that it is a criminal offence in Victoria for a person in authority to fail to protect a child under the age of 16 from criminal sexual abuse. This applies where there is substantial risk that a child under the care, supervision or authority of an organisation (including schools) will become a victim of a sexual offence by an adult associated with the School. The person in a position of authority may be guilty of an offence if they know of the risk of abuse and have the power or responsibility to reduce or remove the risk, but negligently fail to do so. If a person associated with the School who by reason of their position has the power or responsibility to reduce or remove a substantial risk that a child will become a victim of a sexual offence committed by an adult associated with the School, they must not negligently fail to reduce or remove the risk. That is, as soon as a person in authority becomes aware of a risk of child sexual abuse, they will be under a duty to take steps to remove or reduce that risk. A person who has the power or responsibility to reduce or remove a risk will include the Headmaster, School Council members and senior staff, as well as teachers by virtue of their responsibilities. For the avoidance of doubt, any member of staff or person associated with the School who knows of a substantial risk that a child will become a victim of a sexual offence should notify the Headmaster as soon as is reasonably practicable. 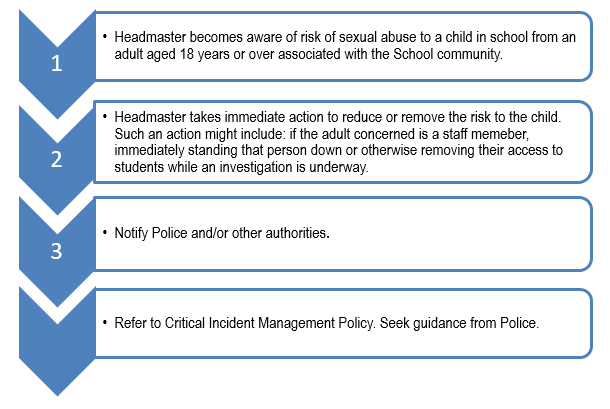 When aware of a substantial risk of criminal sexual abuse to a child in the School from an adult aged 18 or over associated with the School, the Headmaster will act to reduce or remove the risk. The person will be removed from any child-related role pending an investigation. Refrain from activities, conduct or communication involving students or children that would reasonably be seen to have a negative impact on the reputation of the School or employees or students of the School. It is expected that any person interacting with children and students at Brighton Grammar School will comply with the School’s expectations in terms of professional conduct. In addition, teaching staff are expected to adhere to the principles of the Teaching Profession Code of Conduct issued by the Victorian Institute of Teaching. 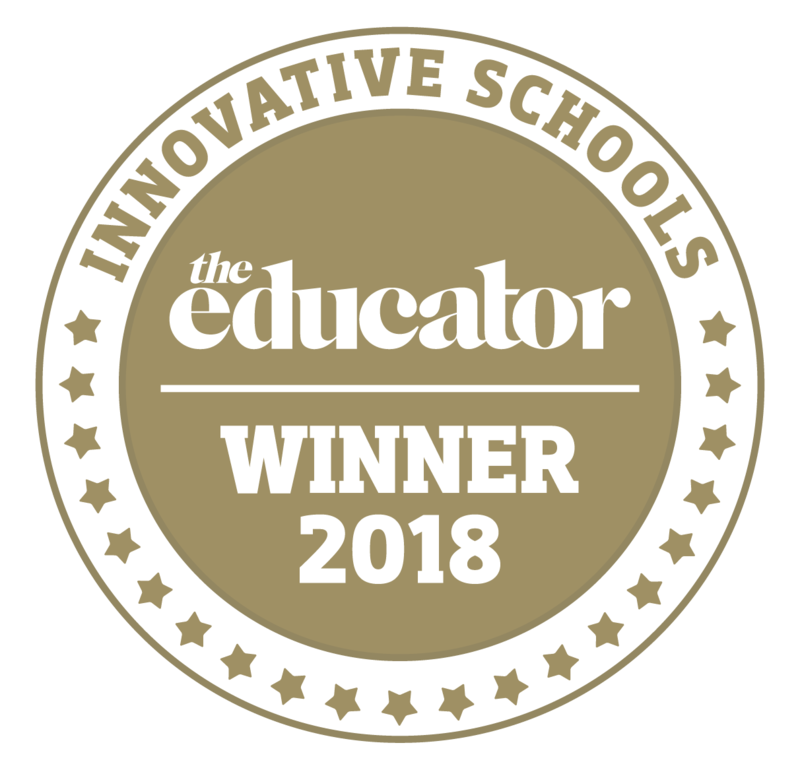 Staff compliance with legal requirements (and the School’s Directions) in respect of matters such as mandatory reporting, privacy, occupational health and safety, negligence, discrimination, harassment and vilification. These expectations also apply outside working hours to the extent that the conduct or consequences of the conduct would have an impact on the staff member’s ability to fulfil the inherent requirements of their role. If a staff member is charged by Police or under investigation for matters regarding the protection of students and children, the School considers the nature of their normal duties to determine whether it is possible for the individual to fulfil the inherent requirements of their normal role while such matters are dealt with. If their normal duties would involve interaction with Brighton Grammar School students the School reserves the right to suspend or exclude the staff member from the workplace while the matter is resolved. If this were to occur, the School would take all reasonable steps to protect the rights and reputation of the individual and to provide access to external and internal support for the individual’s wellbeing. Any steps of this nature would be at the discretion of the Headmaster. In cases where allegations against a staff member are found to have no merit, the staff member shall be protected from potential victimisation as a consequence of any investigation. ensure that a parent or guardian of a student (under 18 years of age) is present when a staff member visits the home on School business or for any other reason. For the purposes of this policy, a ‘Student of Brighton Grammar School’ shall be considered to be a current student of Brighton Grammar School until they withdraw from the School and are no longer enrolled or (in the case of Year 12 Students) the day after an individual’s final examination. However it is also expected that employees, contractors or other visitors of Brighton Grammar School will not socialise or visit at home past students of the School who are younger than 18 years of age without the presence of a parent of the student. It is understood that academic, sporting and co-curricular aspects of an individual’s work may bring them into situations where they may be in close or regular contact with students and or other children, and may develop rapport or may have incidental contact with students outside the context of their duties at School. Attempts by students or other children to build relationships which would be inappropriately familiar or intimate are discouraged and must be reported to the relevant Head of School. In accordance with Standard 6 of the Child Safety Standards (Ministerial Order 870), the School is required to develop, implement, monitor and evaluate risk management strategies to ensure child safety in School environments. The definition of ‘school environment’ in Ministerial Order 870 extends to any physical or virtual place made available or authorised by the School for use by a child during or outside school hours. This includes workplace learning environments where students undertake work experience, structured workplace learning or school community work (volunteering) and School Based Apprenticeships. Identify child safety risks in workplace learning environments. Identify any existing risk mitigation measures or controls. Assess and rate the child safety risks given the existing controls in place, taking into account the likelihood of risk, and the likely consequence of the risk. If the risk rating is more than the ‘acceptable level’, identify further risk management strategies through additional treatments or other prevention, detection or mitigation strategies and then re-assess the risk. A copy of the School’s Child Protection Policy and the Victorian governments Fact Sheet for Employers: Child Safe Standards and Workplace Learning will be given to all businesses in which Brighton Grammar School students are engaged in workplace learning and all sites will be visited prior to or during the placement by the relevant Head of House or the School’s Careers Counsellor. Further to the above, all work experience placements and associated documentation will be arranged in accordance with Ministerial Order 382 – Work Experience Arrangements. All Child Protection and associated policies to be communicated to staff not less than bi-annually. A register of all scheduled Child Protection Programs will be prepared annually for all students, staff, parents, contractors and volunteers. On delivery of each program, the register is to be updated to show the action completion date with verified sign-off by the applicable Head of School or Senior Executive Member. The School’s Child Safety Officer will conduct a sample audit annually to ensure that all aspects of this policy are being adhered to across all campuses and all target groups in the School Community. The audit report will be presented to the Governance and Risk Committee on an annual basis. Breach of this Policy shall be considered either misconduct or serious misconduct (depending on the circumstances) and may result in Disciplinary action (see Disciplinary Policy for further definitions) which may lead to termination of employment and / or reporting to relevant Authorities. Department of Justice: Betrayal of Trust Factsheet: The new ‘failure to disclose’ offence. Department of Justice: Betrayal of Trust Factsheet: The new ‘grooming’ offence. Department of Justice: Betrayal of Trust Factsheet: The new ‘failure to protect’ offence. VRQA Newsletter ‘New obligations to help protect children: Betrayal of Trust implementation’ (Edition 41).